One thing I’ve learned through the years is that farming is not for wimps. In the scheme of things, our farm is tiny, but it still takes a lot of work. We have chickens, dogs, a small orchard, a nice garden and an impressive collection of Japanese Beetles, cutworms and other vermin. It’s a constant battle, but it’s worth it. Each year we have fresh fruit, berries and vegetables. Our hens provide us with more fresh eggs than we can eat, so we share them with friends and family. The girls take the winter off, but once the sun warms in spring, they get back into their nesting routine. Currently, we only have two hens, but each morning I toss in a little scratch feed and give them fresh water. In return, I get two large eggs that look as if they have a tan. even the marked egg. That meant one thing — VARMINT. I marked another egg and vowed to solve the mystery. Friday evening as the sun slipped toward the western horizon, I went down to check. When I stepped in the pen, a huge chicken snake was curled up in the nest with an egg in its mouth. It saw me, spit out the egg and made a hasty retreat. I grabbed it by the tail and tried to pull it out, but it was stronger than I realized. 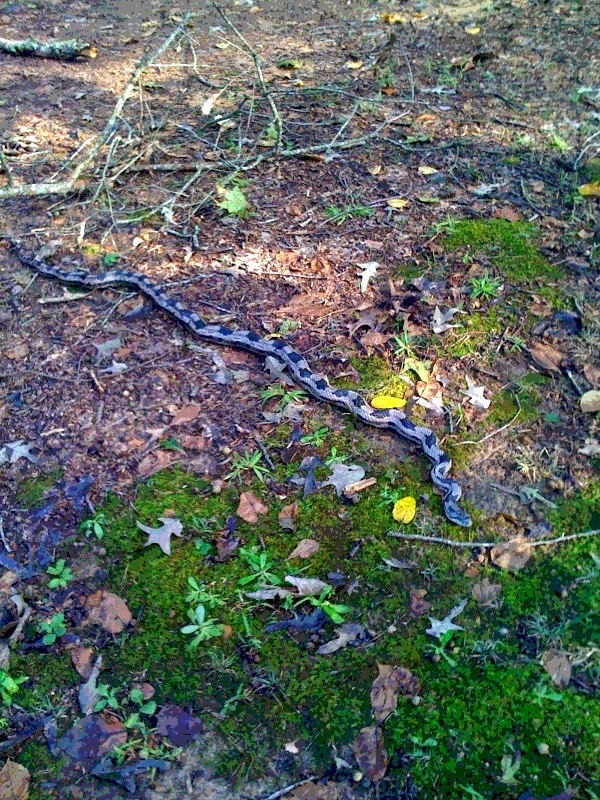 It pulled free, sliding through a crack near the bottom of the nest and slithered to safety beneath my shed. Varmint 1, Rick 0. I put another marked egg in the nest and continued to check it throughout the day. This past Sunday, Jilda made a peach and blueberry cobbler. When I walked out to toss the peach peelings into the pen, the serpent was back with an egg in his mouth. I silently stepped back out of sight and headed back to the house to suit up for battle with a long-sleeve jacket and leather gloves. An old breadbox in the shed, I decided, would make a perfect snake carrier. Jilda came out to supervise. I reached into the nest, grabbed the beast and dragged him wiggling out of the nest. “Be careful!” she squealed, as if I’d be reckless with the snake. As I stepped backward, my leg was tangled in the bottom slats of the roost, and I went sprawling. I landed on the snake, which almost caused a hygiene emergency. But I was on my feet quicker than a cat. Still holding the snake, I flung it into the breadbox and flipped the lid closed. I could hear that rascal writhing in the box. He was not happy, but I took that bad boy about 10 miles from my house and dumped him in an unpopulated part of the county. I snapped a photo of him exiting the box. He looked at me as if to say, “Where do you expect me to get eggs out here?” He then turned and slid into the undergrowth. This morning when I went to the pen, all was well. My hens looked happy, and there were two new eggs in the nest. You are a very brave man, Rick Watson. A good story, but sounds risky to trap a snake yourself! Glad you were able to resolve the problem without harm to yourself!